Highest Quality 7 year outdoor vinyl in bright white. 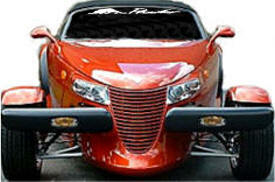 Designed to fit perfectly on your Prowler Windshield. Includes word and Kat logo. Easy to mount comes with everything you need. *Colors are not designed to match any paint color. 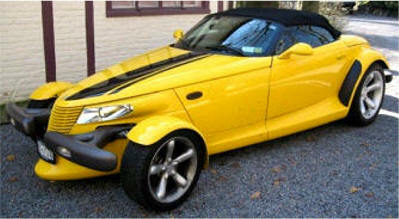 Make your '96-'02 Plymouth Prowler "hot-looking" with this Rally Stripe graphics kit. Easy-to-install kit is packaged as a set of two (2) pieces as shown. They're PRECUT and ready to install in a wide variety of colors - NO TRIMMING required! Stripe package is not just a set of 10" (25.40cm) strips in a box. Kit consists of pre-fitted, tapered and contoured pieces as shown. 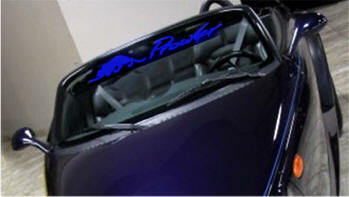 Rally stripes are set to install 1.5" (38.10mm) from center of vehicle at time of installation. 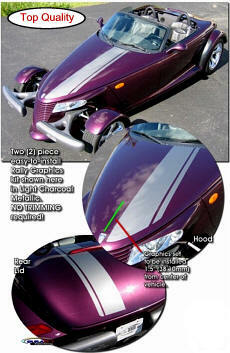 This kit is specifically made for the '97-'02 Plymouth/Chrysler Prowler factory hood and rear hatch areas and will not fit any other vehicle. *many special colors available for cost extra - see color chart.